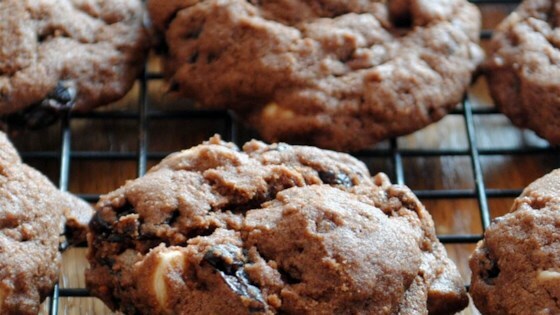 "These wonderful chocolate cookies with tart dried cherries are sure to be a favorite!" Combine flour, cocoa powder, baking powder, and salt in a bowl. Beat the butter and sugar together in a large bowl with an electric mixer on medium-high speed, until light and fluffy. Beat the egg, coffee granules, and vanilla into the butter and sugar mixture until blended. Change the speed to low and pour in the flour mixture. Beat until just combined. Stir in semisweet chocolate chips, white chocolate chips, and dried cherries. Drop spoonfuls of the dough two inches apart onto the prepared baking sheets. Bake 10 to 12 minutes per batch in the preheated oven, until cookies are just becoming firm. Let cool on baking sheets for two minutes. Best recipe ever. Reasonably simple, and gives the humble cookie an amazingly sophisticated taste. I'll make it again and again, I'm sure.